On this day of observance for Rev. Martin Luther King, Jr., take a minute to visit BuildTheDream.Org, the website of the Washington D.C. National Martin Luther King, Jr. Memorial. 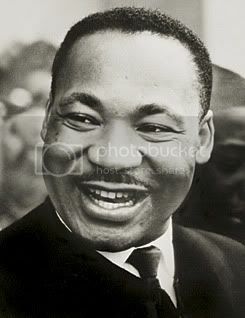 The monument for the great civil rights leader and humanitarian is expected to be completed in 2010. Major donors include General Motors, 10 million; the Tommy Hilfiger Corporate Foundation, 5 million; Alpha Phi Alpha Fraternity, 3.4 million; W.K. Kellogg Foundation, 3 million; Sheila Johnson-Newman, 1 million; and Morehouse College, 1 million. The monument will be located on a four-acre site along the Tidal Basin, adjacent to the Franklin D. Roosevelt Memorial and on a direct line between the Lincoln and Jefferson Memorials in Washington, D.C. The project has raised just over $100 million to date. The goal is to raise 120 million. The Dream Keepers College Program: An initiative to engage college students across the country in efforts to build the memorial. Friends Asking Friends: Build your own 'dream team' by asking your family, friends, coworkers, church members and colleagues to participate. You'll then register your team and create a website to track donations and recruit other members. Greeks Asking Greeks: Join with other Greek-lettered organizations from all over the world, in friendly competition, to help raise money to support the memorial. The Kids Corner: For parents and children! 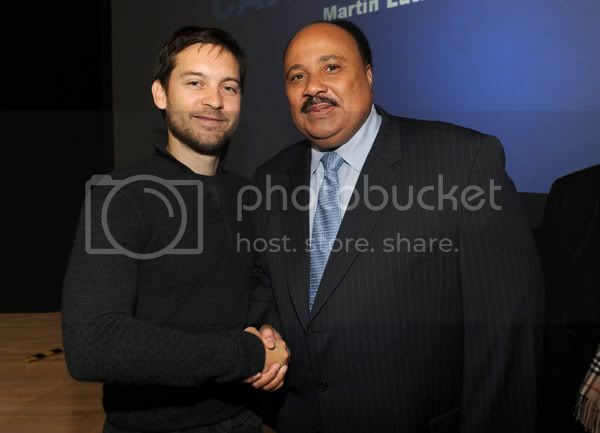 Photo of the Day: Martin Luther King Jr.'s son, Martin Luther King III and actor Tobey Maguire, attended the Entertainment Industry Foundation and Service Nation's "A New Era of Service" Breakfast at Ballou Senior High School on January 19, 2009 in Washington, DC.